Knee arthroscopic surgery (key hole surgery) has evolved significantly over the past few years. With the advent of highly specialised camera systems, precision tools and radiofrequency probes, knee arthroscopic procedure is now widely considered as a gold standard for treating a wide range of knee disorders. Knee arthroscopy is commonly performed for meniscal tears (cartilage tears). Meniscal tears are generally seen in patients after sporting injuries, sudden twisting injuries and often can happen without any injury. As patients get older, the meniscus becomes a bit stiff and can tear with repetitive twisting and turning during day-to-day activities. Once a meniscus is torn, unfortunately, it is unlikely to heal by itself. Symptoms often experience by patients include pain along the joint line, clicking in the joint, discomfort in certain activities, episodic swelling of the knee joint and occasional locking sensation. Symptoms can often wax and wane, but very rarely settle down completely without definitive management. Arthroscopic surgery for meniscal tear can involve repairing the meniscus or trimming/resecting the torn fragment of the meniscus. Delayed diagnosis can make a difference as to whether or not the tear is repairable. Early specialist assessment is recommended for a successful long-term outcome. Knee arthroscopy is also commonly performed for treating ligamentous injuries. One of most commonly injured ligament in the knee joint is Anterior Cruciate Ligament (ACL). Initial diagnosis is confirmed by clinical assessment and MRI scans. Patients generally have ACL rupture following a sporting injury or a pivoting injury to the knee joint. Knee joint often swells up soon after the injury and may take a few days for the swelling to go down. Most patients develop instability related symptoms from the knee joint during day-to-day activities or during sporting activities. Knee arthroscopic surgery can be performed to assess and reconstruct the ACL using your own tendons (hamstrings) using minimally invasive technique. Knee arthroscopy is also useful in treating conditions like loose body within the joint, problems with the lining of the joint, instability of the patello-femoral joint (knee cap moving in and out of the joint) and to assess the degree of wear and tear in the joint. Overall, knee arthroscopy is a very successful operation. It can successfully tackle problems with meniscus (cartilage), ligaments or the lining of the joint. Risks of knee arthroscopy include infection (<1%), bleeding, DVT (clots in your leg), PE (clots in your lung), medical and anaesthetic complications. You are generally admitted to the hospital on the day of surgery. 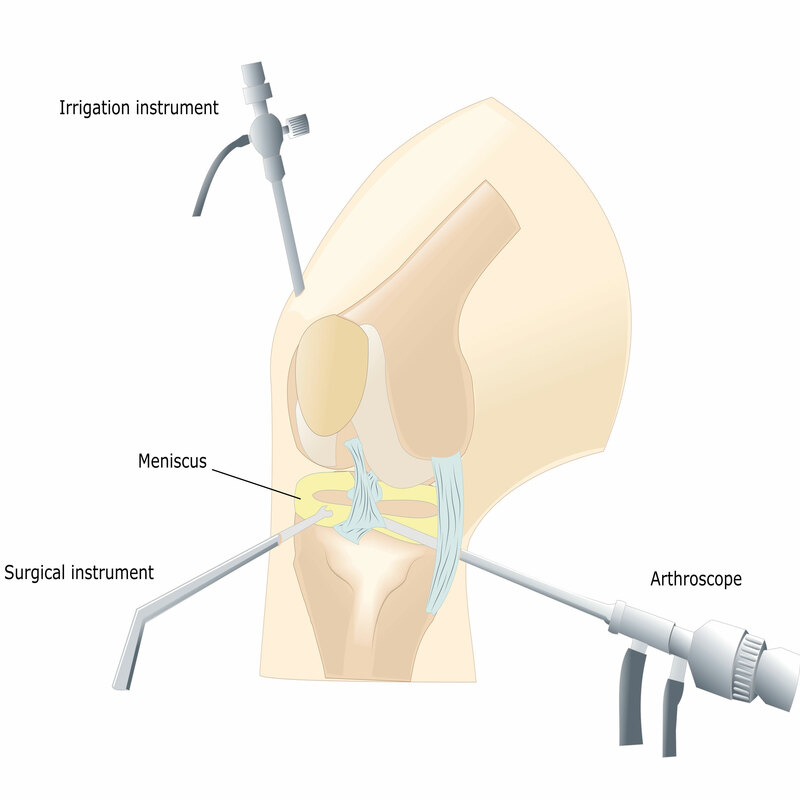 Knee arthroscopy is performed as a day case procedure. During the hospital stay, a multi-disciplinary team including orthopaedic team, ward doctor, nursing staff and physiotherapist treats you. Once you and the team are happy with the progress, you are discharged from the hospital. Post-operative mobilization includes use of walking aids like crutches to begin with. You can subsequently commence independent mobilization as soon as your pain allows. You will generally have two small cuts on the skin around the joint. I normally use steri-strips (tapes) on these wounds, which gives a nice scar and avoids the need for the sutures to be removed. Full recovery following knee arthroscopy can be expected within a maximum of 4 to 6 weeks in vast majority of patients.